﻿World Radio Day: Calendar, History, Tweets, Facts, Quotes & Activities. The idea of World Radio Day was first proposed by Spain's Radio Academy in 2010. The following year, in 2011, UNESCO declared the first World Radio Day. 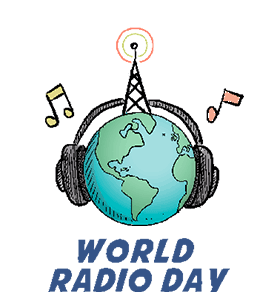 Since then, World Radio Day has been celebrated annually on February 13th, a day chosen to coincide with the anniversary of the United Nations Radio, the UN's international broadcasting service, which was established on February 13th, 1946. The theme for World Radio Day 2018 is "Radio and Sports". The Radio was invented by an Italian named Gugliemo Marconi in 1895. It was originally called the wireless telegraph and used radio waves to transmit Morse code. According to the UN, there are about 44,000 radio stations operating around the globe. It is estimated that approximately 75% of homes in developing nations have access to a radio. Radio is the most intimate and socially personal medium in the world . — Harry Von Zell, radio announcer and actor. Learn Morse Code. The radio was originally invented to pass on Morse code message through radio waves. Watch a movie or documentary that relates to radios. Our favorites: Generation Radio, Invention of Radio, Good Morning Vietnam (1987) and Pirate Radio (2009). Learn about some of the issues surrounding freedom of speech and government control of radios around the world. Read up on recent problems in Zimbabwe and Somalia regarding government control. Set up your very own pop up radio station using digital online suites tools such as ShoutCheap. Setting up your very radio station can be quick, easy and exciting. Plan a Radio Day event involving important issues such as human rights, freedom of speech and international broadcasting. Let UNESCO know what you have planned for World Radio Day and they will put it on their world map so that others can find you and get involved!